This is a recipe I enjoyed even before I found out I have Fructose Malabsorption. All I had to do was swap sugars! Delightful!!! Put the 1 cup of water and 1 1/2 cups of sugar in a pot on the stove at medium heat, stirring occasionally until the sugar has dissolved. Meanwhile, juice lemons until you have 1 cup of juice. I wish I had a citrus press for this reason, because doing it by hand is a pain, but all I have is an old-fashioned glass juicer (I use a mesh strainer to get rid of the pulp). Whatever–it works. Pour sugar mixture into a glass pitcher or other heat-proof container, and immediately add cold water, lemon juice, and cranberry juice. If you have a lemon left over, wash the outside and cut it into slices and add to the pitcher. Store in the fridge. 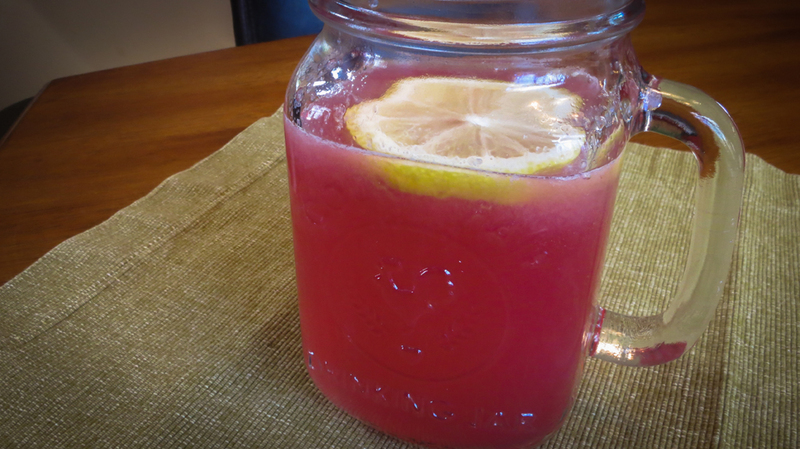 This entry was posted in Recipes and tagged cranberry juice, dextrose, elimination diet, fructose malabsorption, gluten free, lemon, Pink Lemonade by nosugarlessgum. Bookmark the permalink.